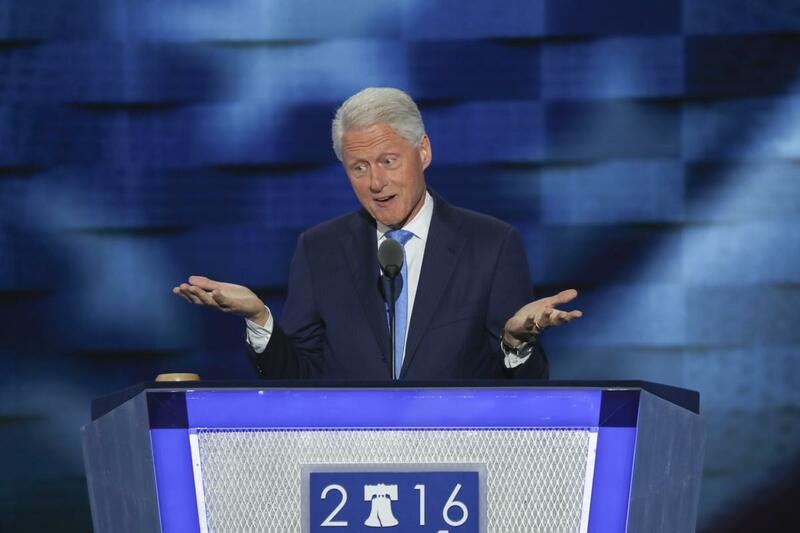 By Joseph Cariz, Adam Thorp on Wednesday, July 27th, 2016 at 1:01 a.m.
Bill Clinton's speech to the Democratic National Convention on July 26, 2016, as delivered. ...and now I'm staring back, we at least ought to know each other's name. I'm Hillary Rodham, who are you? I really liked her family. Her crusty, conservative father, her rambunctious brothers, all extolling the virtues of rooting for the Bears and the Cuba. ...she went to South Carolina to see why so many young African- American boys, I mean, young teenagers, were being jailed for years with adults in men's prisons. And she filed a report on that, which led to some changes, too. Always making things better. I said I know most of the young Democrats our age who want to go into politics, they mean well and they speak well, but none of them is as good as you are at actually doing things to make positive changes in people's lives. And when she did, the people at the law school were so impressed they offered a teaching position. And she decided to take a huge chance. She moved to a strange place, more rural, more culturally conservative than anyplace she had ever been, where she knew good and well people would wonder what in the world she was like and whether they could or should accept her. Now, two years later, Hillary told me about a preschool program developed in Israel called HIPPY, Home Instruction Program for Preschool Youngsters. The idea was to teach low-income parents, even those that couldn't read, to be their children's first teachers. She did all this while being a full-time worker, a mother and enjoying our life. Why? Well, she's insatiably curious, she's a natural leader, she's a good organizer, and she's the best darn change-maker I ever met in my entire life. As secretary of state, she worked hard to get strong sanctions against Iran's nuclear program. And in what The Wall Street Journal no less called a half-court shot at the buzzer, she got Russia and China to support them. Her team negotiated the New START Treaty with Russia to reduce nuclear weapons and reestablish inspections. And she got enough Republican support to get two-thirds of the Senate, the vote necessary to ratify the treaty. Now, how does this square? How did this square with the things that you heard at the Republican convention? What's the difference in what I told you and what they said? How do you square it? You can't. One is real, the other is made up. Look ... a long, full, blessed life, it really took off when I met and fell in love with that girl in the spring of 1971. When I was president, I worked hard to give you more peace and shared prosperity, to give you an America where nobody is invisible or counted out.